The way of communication has changed and gone the days as it was previous. Today there is a small device through which we can communicate and that device name is mobile. In the market there are several mobiles and smart phones available today. 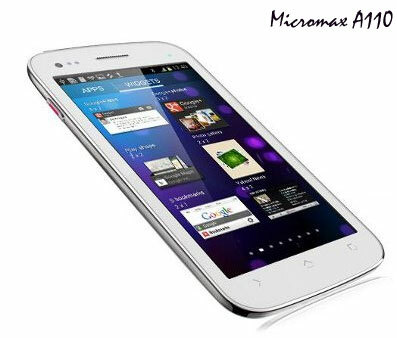 Recently there is a new launch in smart phone category from Micromax and that is Micromax A110. It is Micromax A110 having 2G and 3G network with high speed internet with dual mini SIM giving comfortablity of 2 network altogether. Its display type is IPS LCD captive touch screen with 16M colors measuring 5.0 inches. It is multi touch and protection. Its sound is good having vibration, MP3 and WAV ringtones with loudspeaker. It has 4GB internal memory expandable to 32 GB with Micro SD card. It comes with GPRS, EDGE, WLAN, Bluetooth and micro USB connection giving user advantage of sharing data with many other devices. It has 8 Megapixel camera with dual focus and LED flash. It also has features like face detection, geo tagging and touch focus having secondary VGA front camera. It has android operating system Ice Cream Sandwich with chipset MediaTek MT6577. Its CPU is dual core 1 GHz and GPU is Power VRSGX531. It also has sensors as Accelerometer and Proximity. In messages it has functionality of threaded view, MMS, Email, Push Email and IM. And if you want to search any content on this smart phone then it has HTML5 browser with FM radios and aGPS making your search really helpful provided you do not forget ways while you travel. This Micromax A110 Mobile is available in black and white color with Lion 2000 mAh battery. Its standby time is 180 h having talk time of up to 5 hours. So you really want to enjoy and get entertained while you go anywhere else with multitasking and with other features then Micromax Company A110 is for you.